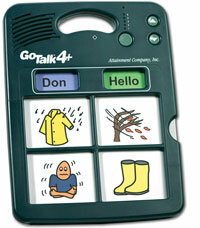 GoTalk 4+ is alightweight and rugged. It has a 20 message capacity (4 keys and five recording levels), plus two ´core messages´ that remain constant when you change levels. Great for essentials, like Hello or All done.